Relevancy Link: Behind the Magic Curtain. Happy Computer! Tees and caps! Wow! We welcome our second JoyPixel advertiser! Please give another warm click to MacWizards! Need a PowerBook AC Adapter? 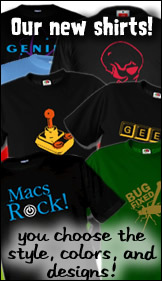 Be sure to catch us at Macworld! What additional Steve Jobs keynote behind-the-scenes element is your favorite? Emergency medical teams on standby for fainting fanboys. Steve Jobs rapid escape ejection system. Nitrozac and Snaggy documenting the event for comic posterity. In case of extreme emergency... Apple pole dancers. Snaggy says California here we are!, ... dragonman97 digs the Keyboard Komic [sic], ... Kiwi Saotome shows some crab art, ... Dr Watson is addicted to DDR, ... Nick wonders about Magic Online Mac Verson?, ... and Aditu's Friday Five is a motley list. And in SuperFan Clubhouse Tidbits: Snaggy shares the origin of the Biohazard Keyboard comic.